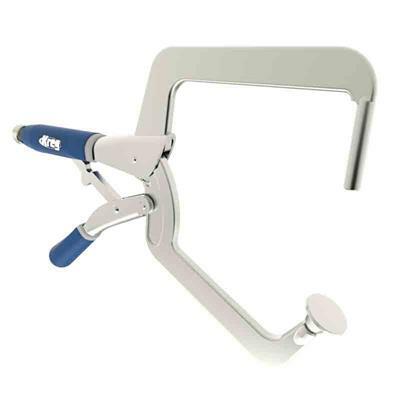 The Kreg right angle clamp helps to align workpieces in 90 degree registration. The clamp is designed with a 3/8" steel pin on one arm that fits down into the pocket hole and anchors the workpiece firmly against the second workpiece to be joined. The opposite arm is fitted with a 180 swiveling pad that automatically adjusts to your material dimensions. Finish the joint by driving a screw into the adjacent pocket hole. Also great for assembling all types of box joints.